Data is from the June 2016 Branding Brand report titled "How To Get People To Download & Use Your App" conducted by Survata. 1,012 US iPhone owners ages 18-44 were surveyed online during May 17-20, 2016. 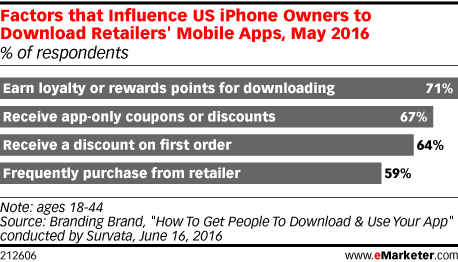 All respondents had previously made a purchase via an iPhone app. Branding Brand builds mobile commerce sites and apps for retailers worldwide.